Facebook Page Link Post Update: Are Links Now More Important? It was hard to miss that a change occurred to the size of link previews on Facebook this week. Now, when brand and company Pages post links to their followers, the once miniscule image preview now appears as a full-width image. This update continues to align with Facebook’s new vision for users’ Newsfeeds, where they emphasize bold, beautiful, and image-conscious content shares. The update was rolled out on Tuesday, September 10, with an announcement on the Facebook + Journalists brand Page. 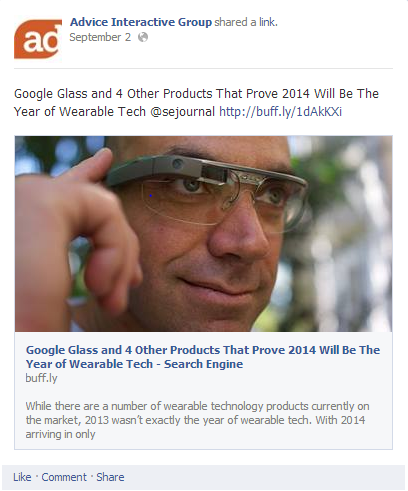 Link preview images will now display at the almost-full width of the Newsfeed area. Facebook now recommends that images accompanying articles or blogs be a 1200x627px, or at a minimum of 560x292px. The update will also affect how ads are viewed across all platforms. Both page post ad and page like ad sizes have been changed in this update. For a comprehensive look at sizing differences and how to optimize your images to the new specs, I recommend Inside Facebook’s guide. If your images are smaller than the recommended sizes, your previews will appear as they always have. Are Links Now More Valuable? Ever since Facebook’s Newsfeed update back in March, marketers have known that focusing on visually appealing content is the key to unlocking better engagement on their updates. But it’s also been a well-established fact (I say “fact” here lightly, since Facebook neither confirms nor denies how its algorithm works) that link shares get less engagement and a less viable total reach than plain text statuses or image shares. But now that link shares are getting a spiffy new update, does this mean their values are about to change? I personally think, and I am by no means a spokesperson for or an expert about Facebook, that links do now hold more juice than previously thought. Image updates of the past held more sway for engagement because Facebook recognized that this type of share would align most with their vision for a visual Newsfeed. But now, link previews take up nearly half of the space allotted to image shares, making me think that links now matter more than they once did. However, I wouldn’t go so far as to think that link shares now weigh more than image updates or even plain statuses. Facebook has always maintained that brand pages should be sharing only the most relevant and interesting content to their followers, and the mighty Facebook algorithm is set in place to police this. Despite having a better visual appeal moving forward, link shares that are not relevant, are not interesting, or are spammy are still not going to get positive engagement, just like before. How Should This Change Your Marketing? If you’re not already thinking about the images you use on your website, the new update is a very in-your-face reminder that you need to do so. Based on how the image previews are now placed within the Newsfeed, the image associated with your link is likely to be the first thing a person notices about your update—instead of your commentary, the link heading, and possibly even the brand/user/Page sharing the content. Capture and hold your audience’s attention. Think about how fast you scroll through your Newsfeed. What makes you stop and read? Appeal to a person’s different sides. It can be their sentimental, humorous, or even their curious side. Compel your followers to click. The whole point of the update is to attempt increasing click-through rates on updates. So give your followers a reason—a good reason—to click on what you’re sharing. Tell the story. Your article or blog post has a story to tell. If you want to engage your audience, the first thing they see—the image on the link preview—should give them a taste of what they’re about to read. Are relevant. When you click on an image of Grumpy Cat, you expect to see a story or other such content about Grumpy Cat. Don’t lead your followers astray (or compel them to unfollow you) by posting images that invite the click, but that aren’t relevant to your story. Nothing intrinsically has changed about how you should market yourself and your brand on Facebook. Facebook has just provided a way for you and your social media marketing team to be even better at what you do by reminding you to focus on what’s important—sharing interesting, relevant content with your followers. Has the new Facebook update changed how you are marketing yourself to your followers? How do you plan on tackling newer, larger, image-heavy link previews? Thank you for this update. Great information! Sharing with my fans. Thanks so much, Katrina! I’m glad you found the information helpful. Home BlogFacebook Page Link Post Update: Are Links Now More Important?